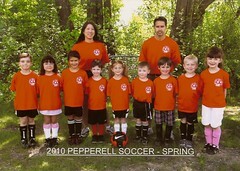 Coach Dova’s soccer team in her last game. Have ice cream at the end of year soccer party. Hug the soccer kids goodbye and grab Dova’s soccer trophy. Rip off Dova’s soccer clothes and put on her dress. Rip off my soccer clothes and put on my dress in the car. Clean Dova’s ice cream hands with a wipe. Rush to the piano recital now in progress (Adam and Doug were already there). 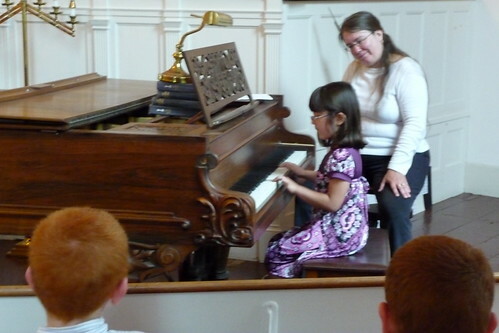 Record Dova in her first piano recital, as well as Adam’s performance. I could finally relax being in the audience, but it was extremely hectic and I vowed never to do simultaneous events again. Here are the videos of Adam and Dova from last year’s recital if you’re interested (i.e. you’re my mom). This year, my soccer coaching career had thankfully ended but the musical tiger mom had taken over. And although we didn’t sign up for simultaneous events, it ended up being busier than ever since I was now directly involved in the recitals. After the talent show fiasco, our kids’ piano teacher asked whether I’d like to play that piece at the recital. I never wanted to upstage her students, so I hadn’t considered performing with them before. She said that one of her students really liked In the Hall of the Mountain King and would love to hear the “real” version performed. Adam loved this piece as well and played a simplified version last year. A week before the recital, our piano teacher asked whether I would accompany one of her voice students on the piano. It was a last minute request, but I looked at the music and agreed. So far so good, one solo that I knew in my sleep and one manageable accompaniment which I had a week to learn, no over-extension. The day before the recital, we rehearsed with the vocalist. 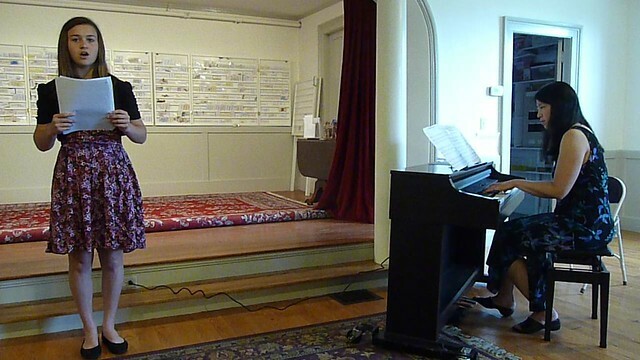 At the end of the rehearsal, our piano teacher was uneasy about another piano accompaniment that she was having trouble with. She asked me on the off chance whether I could learn the piece in one day. Well, let’s see. I sat down and sight read the music, to which our piano teacher said that I already played it better than she did. One day to learn a piece? What’s on the schedule… Adam’s last soccer game of the season, driving one kid to a birthday party and the other to a playdate, and then the end of season soccer party. Sure, I had time between driving the kids and after the party. I agreed to do it. I’m not sure whether I thought it was a good challenge, or I’m that cocky, or what! Doug says my middle name is “Over-extension”. On the day of the recital, I arrived a half hour early for the rehearsal with the new vocalist. It went off without a hitch. In fact it was one of the most beautiful pieces I’ve ever heard, Homeward Bound by Marta Keen (not a link to the actual performance, it wasn’t mine!). The performance went flawlessly as well, and I actually enjoyed being part of creating this beautiful music. Since I'm free to post videos of my own kids, I can proudly put my tiger mom hat on and show them off. Dova was confident and poised in her performance. Adam had been shunning me for practice lately, so I hadn't actually heard him play his piece in weeks. He performed Bach’s Minuet No. 3 evenly and expressively and we were all quite impressed! In fact, he played this piece better than I would have at his age. See for yourself. Luckily our camera ran out of memory so I don’t have to share my performance that day (you can always view the talent show version). The only thing I regret about performing in the kids’ recital was that I was put at the end of the program. Through his two years of lessons, Adam had been progressively moving down the program as he learned more difficult pieces. In this recital, he was finally placed last out of the students (he played Bach’s Prelude in C later on). Except his mom stole the last spot on the program. But there was a surprise in store. 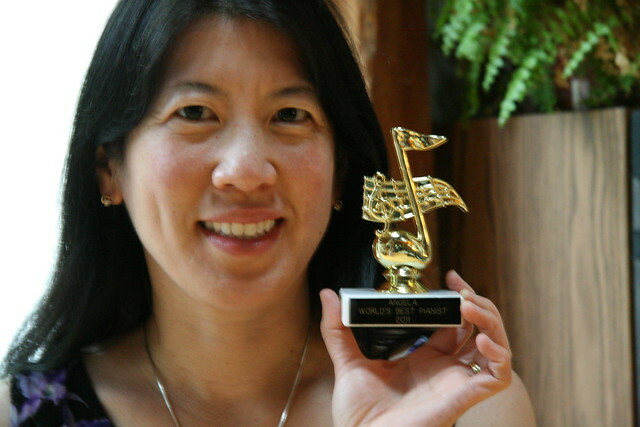 After my performance, the piano teacher presented me with a trophy for all my efforts. It was partially to make up for the unjust treatment during the talent show, and partially to thank me for helping her out. My very first music trophy! It was a super sweet gesture. I guess Supermoms can get trophies too! What a nice gesture on the part of the piano teacher. You deserve it! I am the proudest person to watch my three sweetie pies performing at the piano recitals. I enjoyed every minute of it, beatifu! Way to go mummy!!.. You must be very proud seeing your kids performing at the piano recital. I enjoy my elder boys once yearly piano recitals and can't wait for the younger boy to be proficient enough to join him next year.